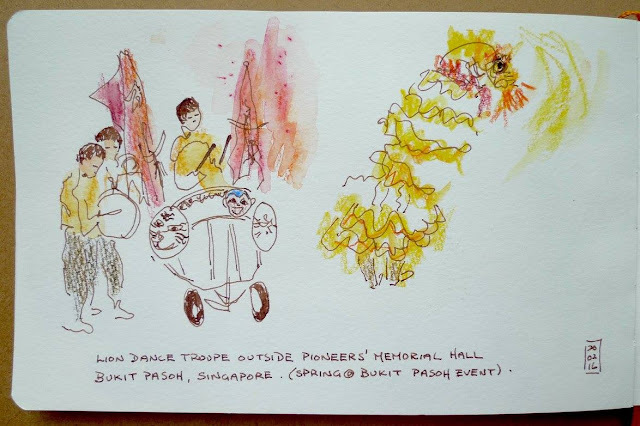 I was at Bukit Pasoh Rd, Chinatown, Singapore last Saturday for the Spring@Bukit Pasoh community event. 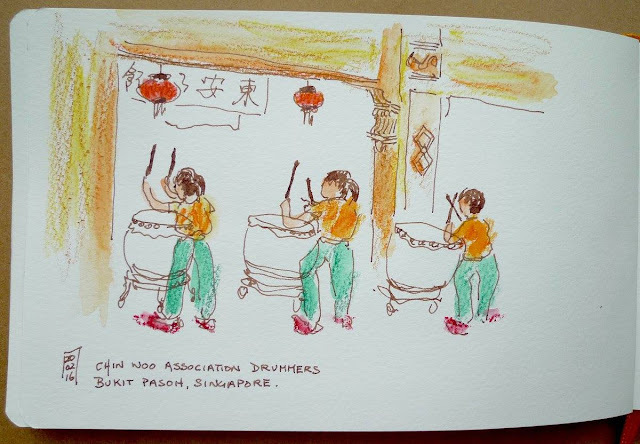 Two lion dance troupes went up and down the street performing outside this street of Chinese clan associations. It was a thrill to be sketching right among the performers. The child drummers were especially amazing! They wore big funny red furry shoes. I added a smear of colour at home from memory with watercolour pencils. A view of the performers on Bukit Pasoh Rd. The area is rich in history dating back to the 1800's and the buildings show interesting architectural styles. #LamyPens, #DeArtramentisBrownInk, watercolour pencils, #HandbookJournal (watercolour) 5.25”x8.25”. 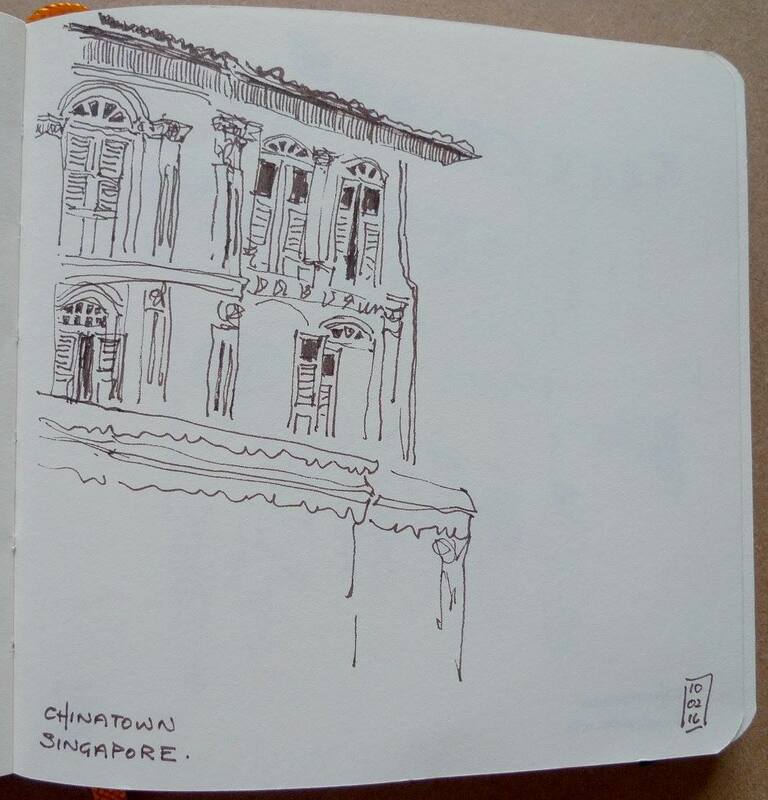 Sketching at my old school CHIJ (Convent of the Holy Infant Jesus) which has now been turned into a tourist precinct called CHIJMES. The old classrooms have been converted into trendy restaurants. Some of the old buildings of the school like the chapel and Caldwell House have been restored and gazetted as national monuments. Caldwell House was built in Singapore in 1840 for H.C. Caldwell a magistrate’s clerk. In 1854 it became the first convent quarters for nuns from the order of the Holy Infant Jesus who had arrived from France to set up a girls’ school. Over the years the convent became a premier school, orphanage and refuge for women. Here is Caldwell House and the chapel (now popular for wedding receptions). This is the passage between Caldwell House and the chapel. I love the archways and the tiles along here. I still get a thrill walking through the brick red tiled courtyards and can almost hear the sound of white canvas Bata shoes as hoards of girls stomped up the spiral staircases after recess time. When I was at school I never stepped into Caldwell House (were we even allowed to?). This was where the nuns did their reading, writing and sewing. I believe important visitors were also received there. Click here for more on the history of CHIJMES. 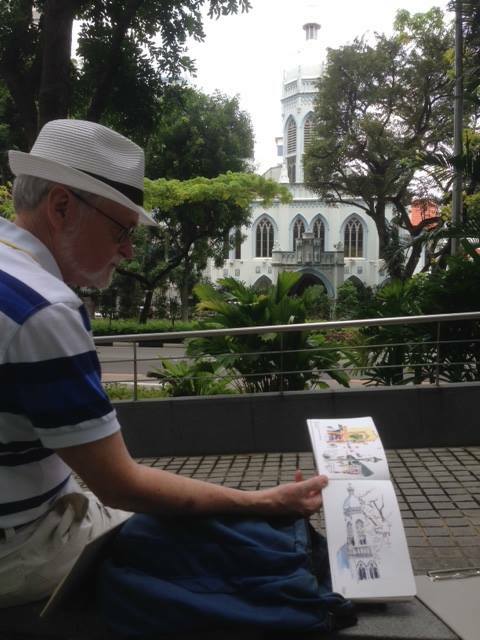 This is St Joseph's Church sketched from a shady spot outside the National Library, Singapore. 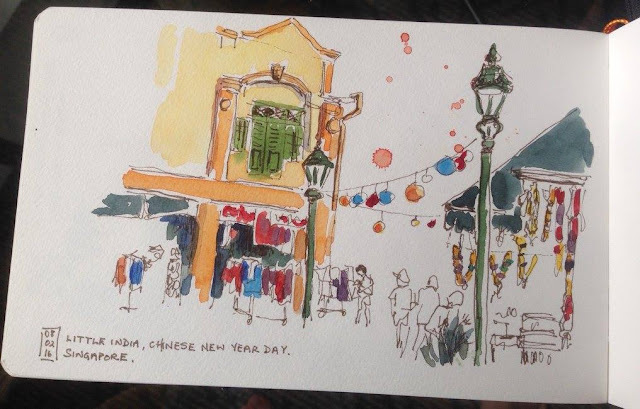 My sketch was completed during the SG Heart Map Exhibition Sketchmeet of Urban Sketchers Singapore. I found myself sketching next to a young sketcher from Toronto! A fellow sketcher holds up my sketch. St Joseph’s Church was completed in 1912. It was built on the site of the Church of São José. Both churches were built by the Portuguese Mission from funds left by Father Francisco da Silva Pinto e Maia who arrived in 1826 and set up the mission. In 2005 St Joseph’s Church (built in the Gothic Revival style) was gazetted a national monument. 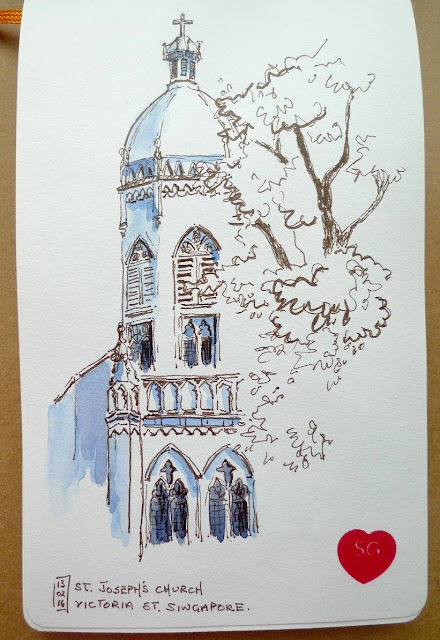 #FaberCastellPittpens, watercolour, #HandbookJournal (watercolour) 5.25”x8.25”. In Chinatown on Wednesday with a relative. 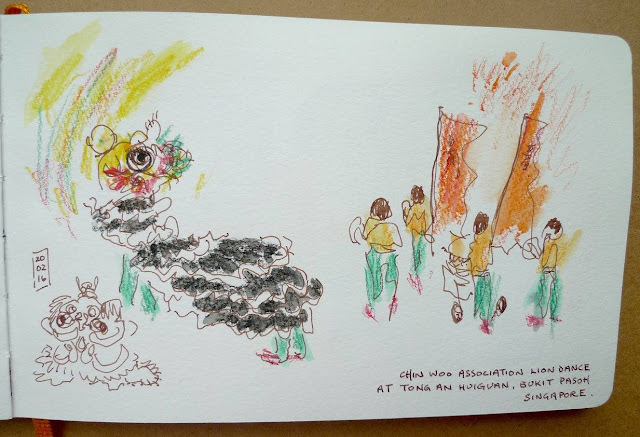 She's an incessant shopper, I'm an incessant sketcher. I guess we make a good pair when out together. This was the third day of Chinese New Year and a lot of merchandise was discounted (we think). In half an hour, I had done these three sketches (dark embellishments added at home) from the one spot. 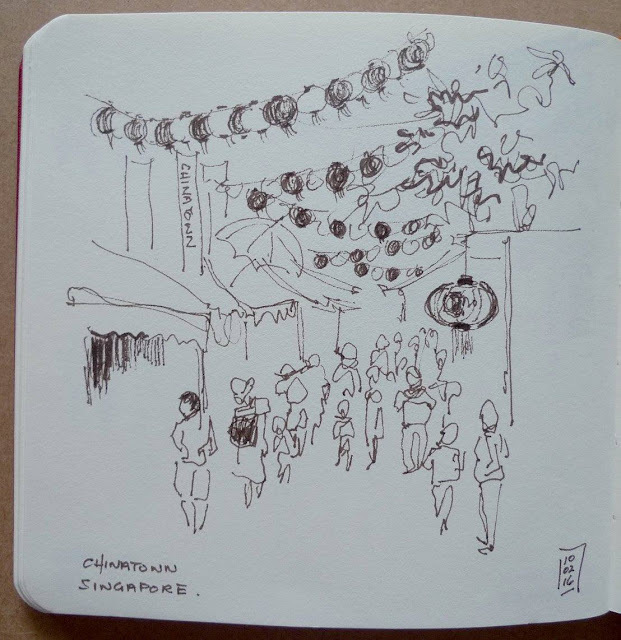 She managed to traverse the whole lane of stalls and returned with three bags of purchases. I guess we both had a good morning. Singapore’s Little India! Where better to go on Chinese New Year’s Day when just about everywhere else in the city is closed for business. 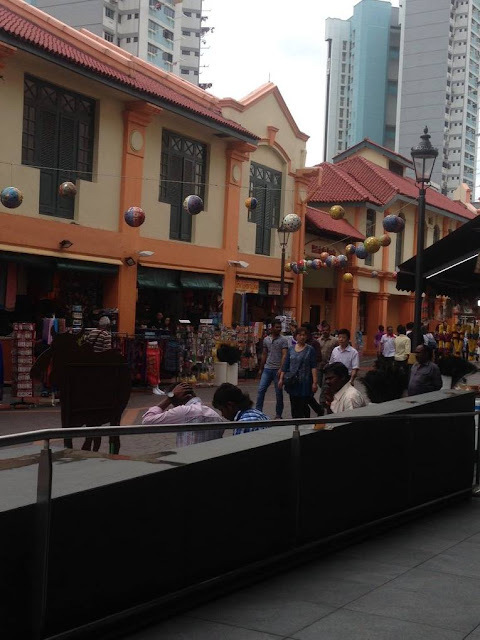 Little India was hopping with life from the mainly male Indian foreign workers enjoying the public holiday. 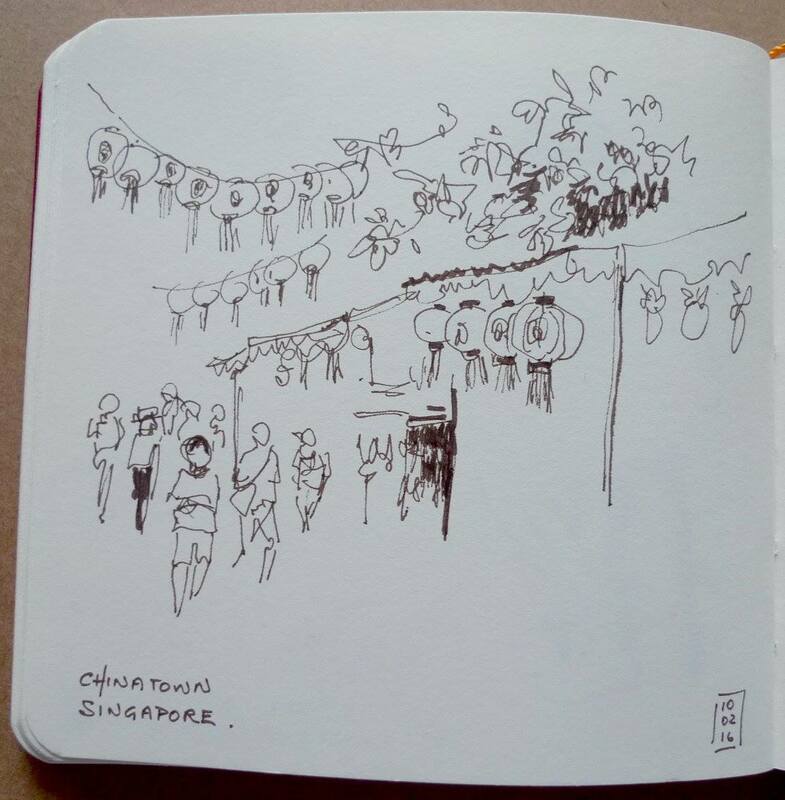 Nice loud toe-tapping Tamil music and comfortable seating outside the Indian Heritage Centre as well made for a pleasant sketching experience. Unfortunately the Indian Heritage Centre was closed (as it is every Monday). This past weekend I joined the Urban Sketchers Singapore's January sketchmeet which was held in Chinatown. What an enthusiastic group and a fabulous turnout again! So nice to meet up with friends I had made when I last spent an extended period in Singapore in 2013/14. Having come not so long ago from a Canadian winter, it felt hot and tiring sketching outdoors. The steps I was sitting on was hard on the bum but what a buzz in Chinatown just a week before Chinese New Year and the skilled sketchers around me were an inspiration. I seem to sketch faster (and better ?) at sketchmeets. Here was my sketch for the day (completed at the sketchmeet). I spent a lot of time chatting with friends and tried to watch the guest demo by watercolorist Ng Woon Lam. Unfortunately the crowd around him was too big to get a good view but I caught some of his free watery style. Wish I could paint like that!